PROCEEDINGS IAU S)1WOSIUM 112 Michael D. Papagiannis Department of Astronomy Boston University Boston, Massachusetts 02215, USA 1. 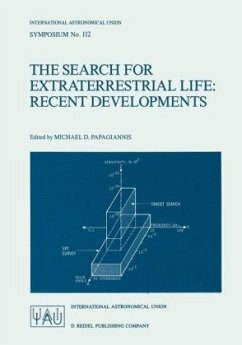 THE SYMPOSIUM AND THE PROCEEDINGS IAU Symposium 112 - The Search for Extraterrestrial Life: Recent Developments, was held in Boston and in particular at the new Science Center of Boston University, June 18-21, 1984, and was attended by about 150 participants from 18 different countries. It was the first official scientific meeting organized by IAti Commission 51, the youngest of all IAU Commissions, which was established only in 1982 at the 18-th IAU General Assembly at Patras, Greece. This Volume of the Proceedings contains nearly 70 papers with about 90 authors from 20 different countries, including two papers from our Soviet colleagues (Kardashev and Slysh) who had not been able to attend our Symposium in Boston. The Volume is divided into eight Sections, the first of which serves as a general introduction, and the other seven correspond to the seven Sessions of the Symposium.